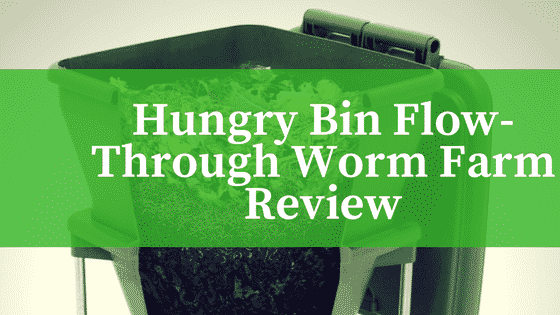 If you have ever become impatient with the composting process, the Hungry Bin Flow-Through Worm Farm may be ideal for you. This vermicomposter relies on worms to transform kitchen waste into high-quality natural fertilizers. As the worms eat the organic materials that you put in the composter, they create castings, or waste products. The castings are a highly concentrated natural fertilizer that can be added to your garden or indoor plants. 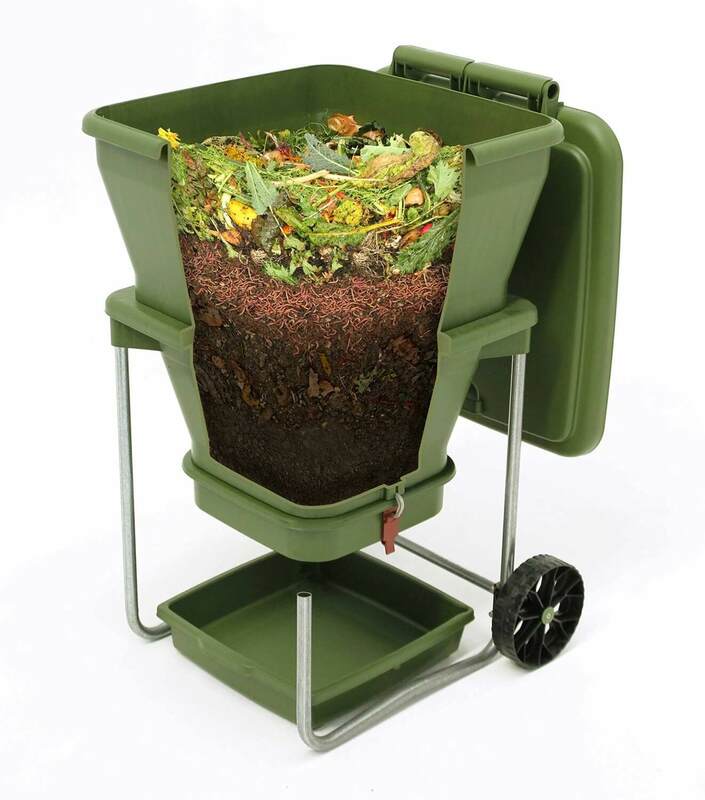 It has a patented design that composts food scraps quickly without taking up a lot of space. It’s easy to harvest the nutrient-rich castings and worm juice, because this bin has specialized collection areas for these compounds. The tapered design of the bin encourages the worms to live at the top, where you add the food scraps. This helps to ensure that all of your organic material is eaten by the worms. Most vermicomposters are heavy and must be wider than they are tall, so they take up a lot of space. 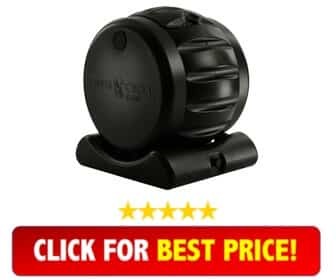 This product has a unique design that creates a small footprint. The top is wider than the bottom. This creates a continuous flow system that is different from a worm farm that uses stacked trays. The tapered design forces the worm castings down toward the harvester but keeps the worms toward the top, where they can be the most useful at breaking down your kitchen scraps. The pressure created in the tapered design creates a natural plug that keeps the soil and scraps in the top as you remove the bottom to harvest the castings. The casting collection area accommodates about ¾ gallon of castings and is usually free of worms. As the worms create liquid waste, that watery fertilizer drains into a tray at the base of the composter. The tray contains an easy-pour spout that lets you disperse the fertilizer exactly where it is needed. The completely enclosed composter sits above the ground. This keeps vermin away from the food scraps. The lid secures with a latch so that it cannot be lifted by animals or the wind and also seals against insects. If it gets too cold or too hot outside, you can easily move the bin to a different location. The top of the bin contains a secure handle. Simply tip the entire bin onto the large wheels and move it to the desired area. The zinc-plated legs are durable and weather resistant. The product is approximately 23.5 inches wide, 25.5 inches deep and 37.5 inches tall. The convenient height lets you add kitchen scraps without bending and straining. It weighs about 26.5 pounds when empty. While full, it can weigh up to about 210 pounds. 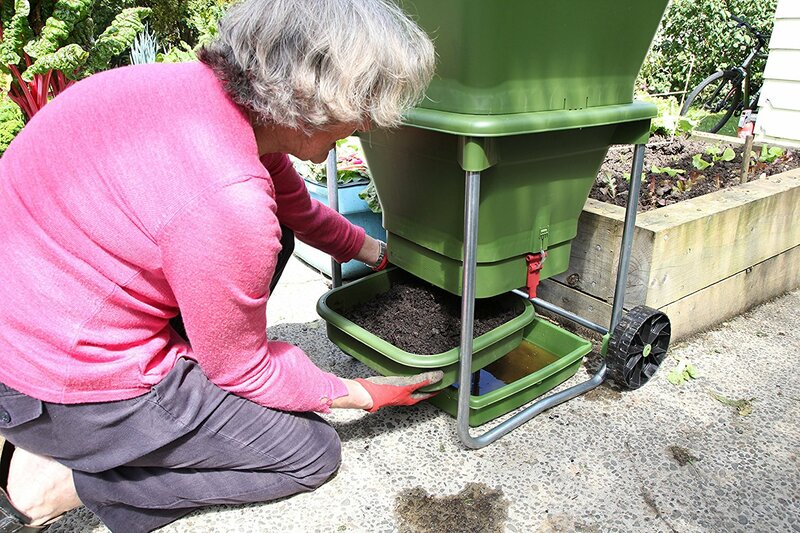 Worm composters that aren’t on wheels are extremely difficult to move at this weight. The Hungry Bin is still transportable because of its design. This kitchen composter can process about 4.5 pounds of waste per day. For people who want to avoid filling up landfills with their kitchen scraps, this is ideal. If you have a lot of yard clippings and waste, you may find this composting bin to be too small. 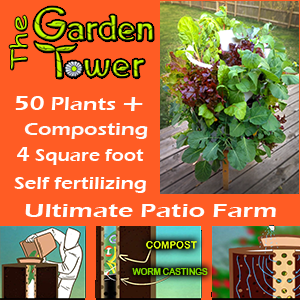 Easy to harvest – No heavy lifting or sifting out messy dirt and handling worms. No turning – The continuous flow system creates a natural composting process that doesn’t require you to mix or turn the material. Compact size – Smaller than the average outdoor garbage can, this bin can be placed just about anywhere, indoors or out. 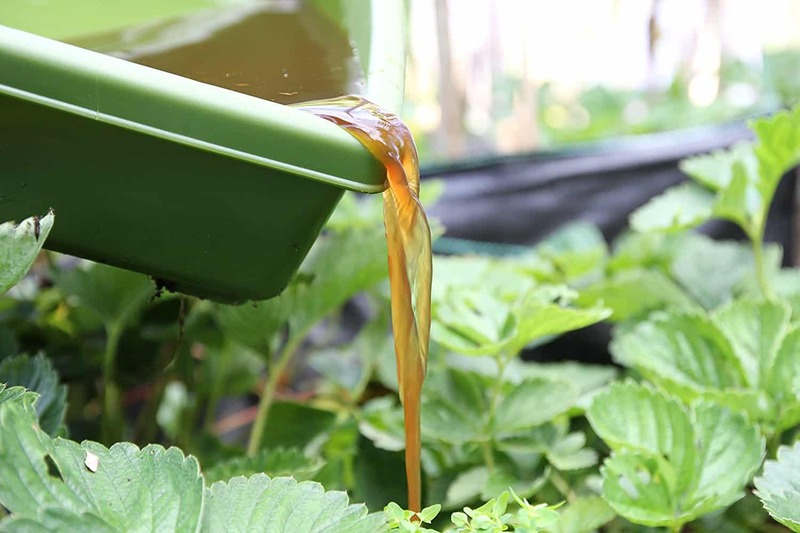 Drip tray – Make use of the nutrient-rich liquid waste that the worms create. Not ideal for extreme weather – Worms can die in freezing temperatures or hot weather that reaches more than 90 degrees Fahrenheit. The bin can be moved to a more temperate location in the middle of summer and winter. Hefty price tag – This composter is one of the more expensive options on the market. However, the cost is often outweighed by the benefits to the garden. You may never have to purchase a chemical fertilizer again. Is The Hungry Bin Right For Me? The Hungry Bin creates rich, useful compost in less time than traditional composters. It is easy to assemble and simple to use. 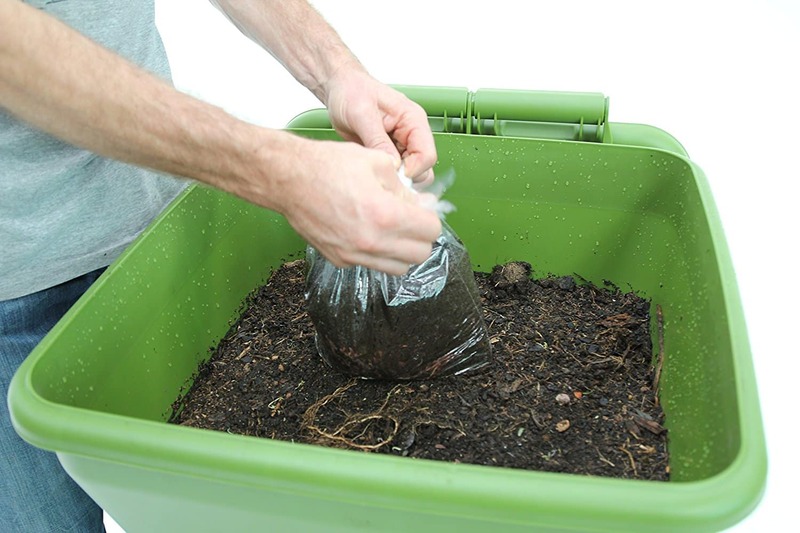 You don’t have to deal with the hassle of sifting out worms and lifting heavy boxes of dirt, which are often the disadvantages of working with a worm composter. It’s not cheap, so you might not want to invest in it if you’re not sure that your gardening hobby will take off. However, if you are an avid gardener who spends money on high-quality soils and fertilizers, you may find that you end up saving money in the long run when using the Hungry Bin. As long as you have a place to put it outside and an area to move the bin into when it gets too cold or too hot, you should be able to take advantage of this composting bin’s benefits.